Out of 2000 nominated High Schools, Green Hope Theatre was one of the 50 High Schools selected to perform a one-act show at the Edinburgh Fringe Festival in August 2019! Mr Gorski will be having Fringe Festival informational meeting on Wednesday, 5/24 in the Chorus Room from 6 to 6:20 PM. This meeting is for current freshmen and sophomores interested in participating in the Fringe Festival. Payment plan information and contracts will be distributed. 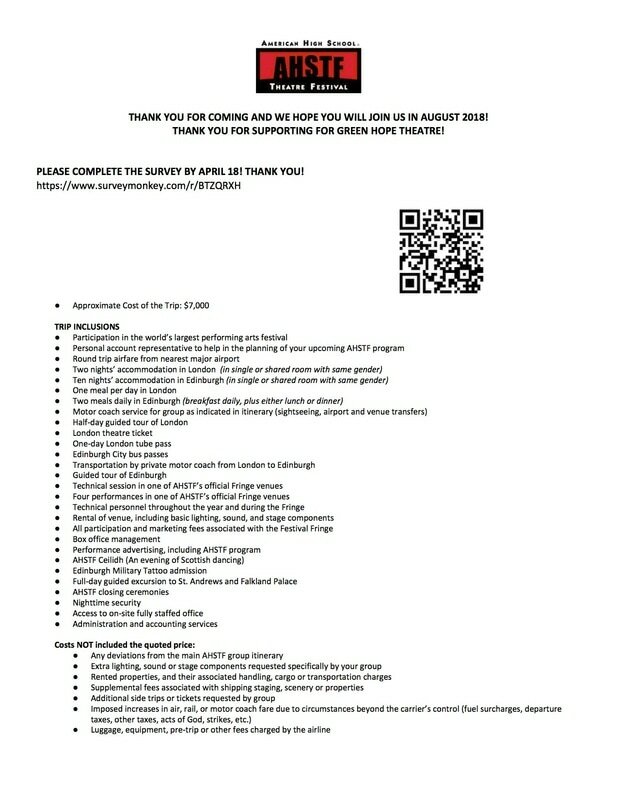 •COMMIT to go as either an Actor, Technician, or Supporting Participant for Green Hope Theatre! •RAISE the money to go! Approximate cost of the trip is $7,000 per person. •AUGUST 4 (ISH) 2018– leave for our 14 day trip to the Fringe! •COMPLETE the Interest/Commitment Survey by Tuesday, April 18!